The secret to Chem-Dry of Santa Clarita Valley’s cleaning method is The Natural®, a cleaner which contains millions of microscopic carbonated cleaning bubbles. These carbonated bubbles penetrate deep into the fibers of the carpet, uprooting dirt and grime from the carpet fibers to the surface. After allowing time for the carbonation to react with the dirt in your carpet, we use hot water extraction to lift the unwanted particles out of your carpets for good. This concept is almost identical to that of using club soda to remove a stain from a shirt. It’s both natural and powerful. The awesome cleaning power of carbonated solutions creates a powerful reaction that deep cleans carpets and upholstery in a safe and gentle way. Due to the natural power of carbonation, Chem-Dry doesn’t need to use excessive amounts of moisture to clean your carpet or upholstered items. This means that there isn’t excess water sitting underneath your carpeting where mold and mildew can grow. Chem-Dry of Santa Clarita Valley also doesn’t rely on soapy cleaning chemicals that steam machines rely on.The soapy cleaning formulas leave behind dirt-attracting residue that can cause your carpets to get dirtier, faster. 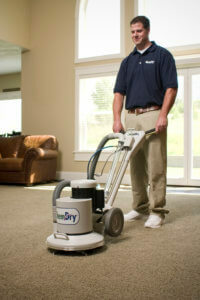 Rather than having to schedule a carpet cleaning appointment more often, Chem-Dry of Santa Clarita Valley’s primary carpet cleaner contains no soaps or detergents so you get healthier and cleaner carpets which means less professional cleaning required . You may have seen the same stains reappear time and time again. You scrub them, or rent a carpet cleaning machine and yet a few days later they reappear, almost like magic. The problem here is that the stains weren’t actually removed in the first place. When you scrub or steam clean stains, what actually often happens is that the stain is pushed deeper into the carpet fibers. You can’t see it during the cleaning, but as the carpet dries, the stain is wicked back up to the surface. Plus, soapy cleaning solutions can leave behind a sticky residue that just attracts more dirt and grime to the same spot, making it worse instead of better. Through the use of our carbonated carpet cleaner, Chem-Dry of Santa Clarita Valley thoroughly removes stains quickly and efficiently. Our carbonated cleaner works from the bottom to eliminate stains, instead of driving stains deeper into the carpet only to crop up again later. Stains are gone for good with! We are so confident in our process that if a spot does reappear we will work until the problem is solved! We want you to be completely satisfied with our carpet cleaning services in Santa Clarita!